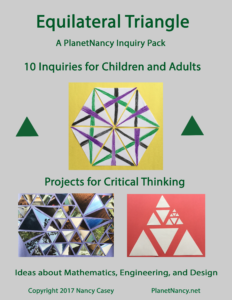 An Inquiry Pack is a collection of activities and ideas that invite you to think as a mathematician, an engineer and an artist. You are encouraged to get away from the screen, fiddle with objects and think about what you are doing. The inquiries in each pack offer a variety of ways to observe what’s in front of you, ask yourself questions, answer them and connect your ideas. Each Inquiry Pack is organized around something to make. One person can do the inquiries alone, or groups can work together. When children and their caregivers (parents, grandparents, siblings, babysitters, teachers…) collaborate, there are many opportunities for critical thinking and communication that will challenge and delight everyone. Description: First you learn to make equilateral triangles from a sheet of paper. Then you perform experiments with them. You will explore simple and complex ideas about counting. 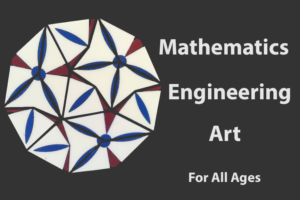 You will gain insights into geometry and other types of spatial reasoning. Your creations will be both interesting and beautiful.